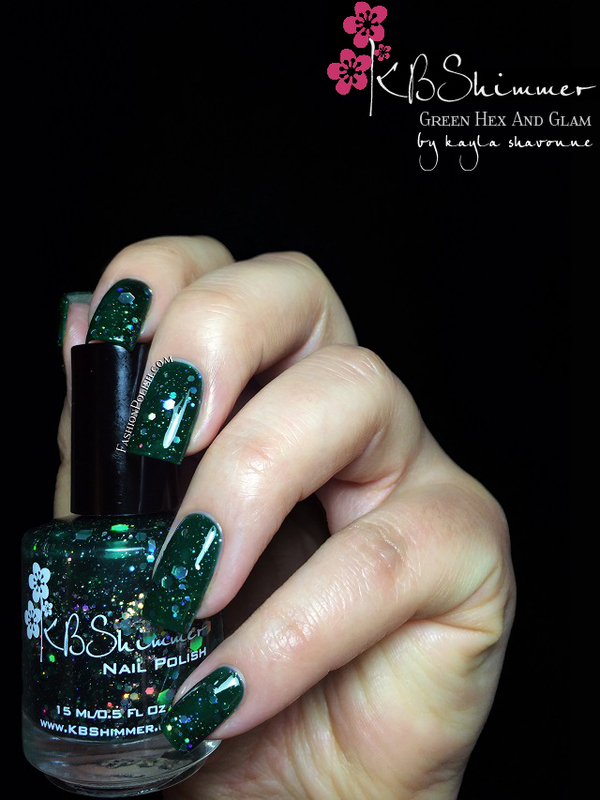 Fashion Polish: KBShimmer Winter 2013 Blogger Collection! 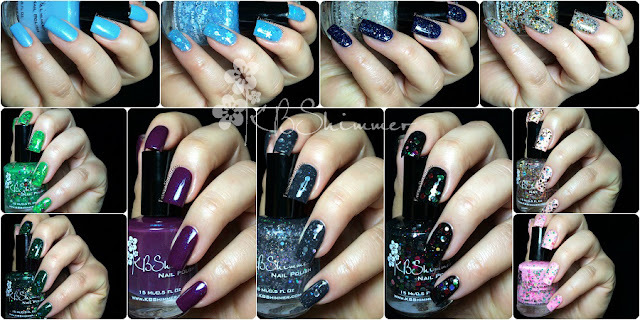 KBShimmer Winter 2013 Blogger Collection! Hi guys! Soooo... How was NYE? Any resolutions for 2014? We had a great time here and yes, I do have a new year resolution this year, just one : updating my spreadsheet! Long story short, I'm going to really try to work on my spreadsheet. If you have any tips or tricks or if you're using an app to keep track of your stash, I'd LOVE to hear about it! I've been dreaming of the perfect app for ages with no luck. One of my friends uses Bento but it's pointless if you don't work under a mac environment, plus I heard they're letting go of it anyway... My dream app would allow excel import/export as well as photo upload / catalog view and category sorting. It's a lot, I know! Any help would be greatly appreciated! So... enough ramblings, I have my review of the KBShimmer Blogger Collection to show you today! I literally LOVE bloggers' collections, don't you? "A green jelly with multi-colored squares, circles, and stars. 3 Coats Recommended"
Excellent glitter pay-off, no "fishing" necessary. I used 2 coats here and didn't mind the slight VNL but if you do, you 'll want to add a third or give layering a try. "A forest green jelly with holographic hex glitters. Best in 3 coats." Again, I used 2 coats here and liked it that way but you'll might consider adding a third, as recommended, for more opacity. "Clear top coat with shimmering white flakes and holographic glitters. 1 Coat Recommended"
Butter smooth application, dense and regular glitter coverage in just one coat. Shown here over navy jelly. 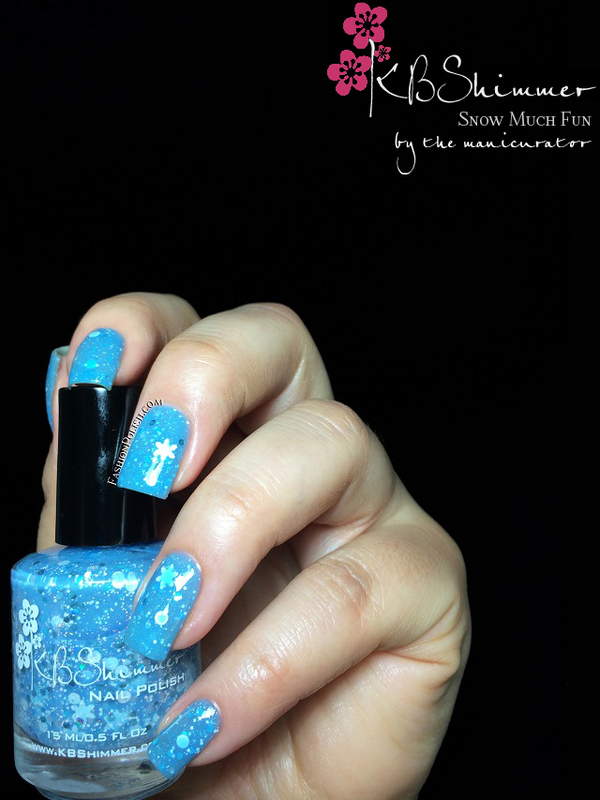 "A light blue is a matte polish with subtle iridescent shimmer sparkles like the snow. 2 Coats Recommended"
Formula was surprisingly opaque, slightly on the thick side but very manageable. Coats used : 2, no topcoat. "A light cotton candy pink polish featuring red, green and neon glitters in a variety of shapes. 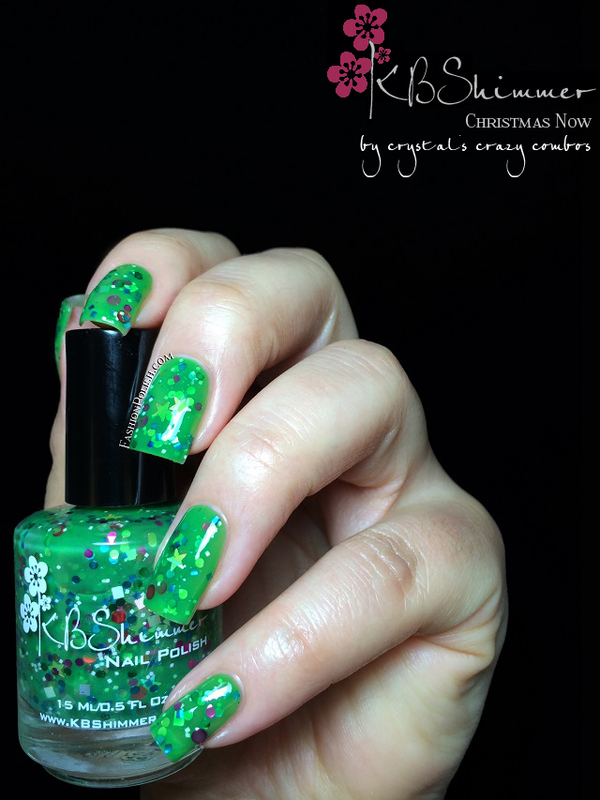 2-3 Coats Recommended"
Nice and effortless application as usual with KBShimmer, excellent glitter load on the brush. This is 2 coats. "A rich plum color with blue shimmer. 2-3 Coats Recommended"
Formula was nice ans easy to work with but I experienced minor unevenness on a couple of nails. I used 3 coats plus topcoat below. "A golden toned sand inspired polish with pops of orange, aqua, and holographic stars. 1 Coat Recommended"
Perfect glitter topper and application. I used 1 coat over taupe plus topcoat. "A light blue jelly with light blue holo glitter, white glitters in several sizes and finishes, a sprinkling of micro holographic glitter, and white snowflake glitter. 3 Coats Recommended"
I feel like I'm repeating myself today... Application was effortless and glitter payoff excellent, I used 3 coats. 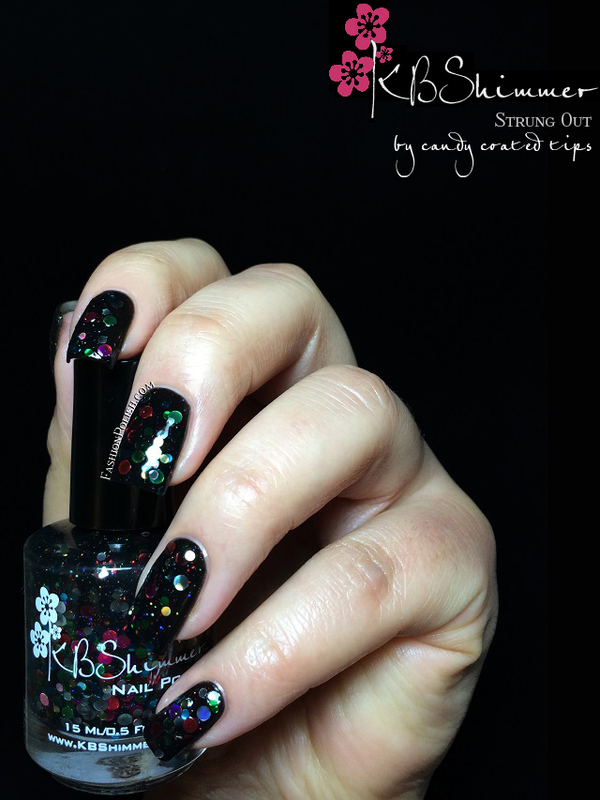 "A black jelly polish with circle “light” glitters in gold, silver, green, blue, red. 1-2 Coats Over Black Recommended"
I used 3 coats and no underwear to see if it could reach full coverage on its own and it did. I do, however, recommend as well layering it over black for best results as the glitter tended to pile up. "A clear glitter topper loaded with glitters in shades of gold, silver and pink in circles and hex shapes to mimic champagne. 1 Coat Recommended"
A very dense glitter topper with larger pieces, 1 "dabbed" coat was all it took in my swatch below. 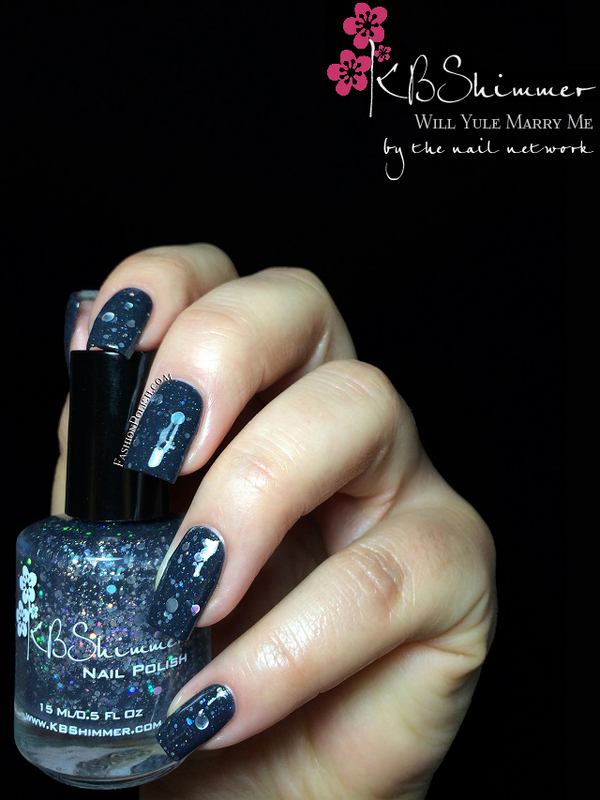 "A navy blue creally with sparkling silver holo circle and hex holo glitter. 2 Coats Recommended"
And yet another perfect formula, application and glitter pay-off, completely opaque in 2 coats. Another beautiful KBShimmer collection with so many different colors and finishes, there's definitely something for everyone! My top picks : Plum Tuckered Out, Will Yule Marry Me, Strung Out,I Only Have Ice For You and (to my surprise) Snow Much Fun! I can't wait to hear your thoughts on this collection? Do you, like me, fangirl over bloggers' collaborations?